Holy moly!!! 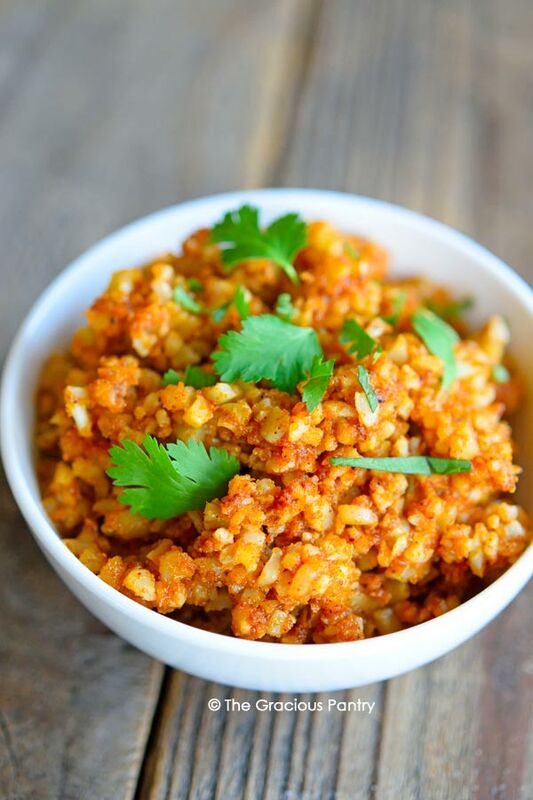 This clean eating Spanish cauli-rice recipe was so amazing! I couldn’t even tell it wasn’t real rice! Seriously. It was incredible. As some of you may know, I’m working on reducing carbs in my eating plan to help my blood sugar get back into normal ranges. I’m nowhere near as strict as I was last year when I was trying to follow my doctor’s plan, but I’m definitely low carb and loving it! 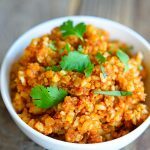 And this cauliflower rice is just one example of why I’m loving this so much. If you prefer more carbs, you could add some corn to this and enjoy a side of beans. But do give this a try because it was crazy delicious! Love Spanish rice but don't love the carbs? Give this low carb, clean eating version a try! In a skillet, warm the oil and then add the cauliflower. Cook until it has almost reached the level of doneness you prefer. Stir in the tomato paste and spices and stir well to combine. HI.What type of oils can i use?.Olive? The nutritional info; is this for the whole recipe? Are you sure it’s tomato paste and not tomato sauce? I feel tomato last would be too thick. Morgan – That’s how I made it. But use sauce if you prefer. Thanks so much for adding the Nutrition Facts, it really helps when you dont know how to calculate it and on the Keto. Have a good day??? ?